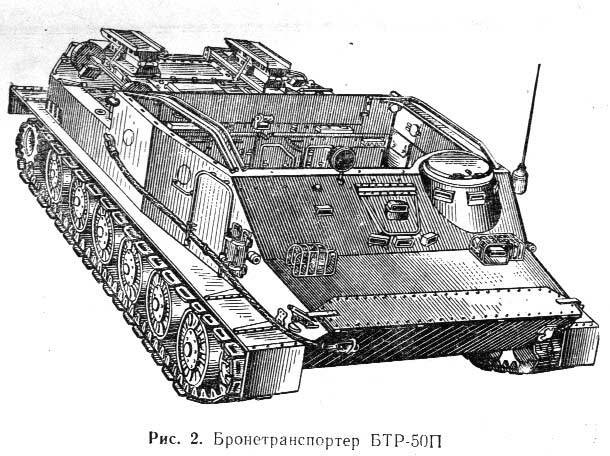 The BTR-50PK is one of only two tracked members of the BTR family- the other being the BTR-D ‘Robot’, essentially a BMD-1 without the turret. The 50PK is, like the BTR, based on a vehicle outside the BTR family- namely the PT-76 Amphibious Tank. The running gear, lower hull and water propulsion system are all that of the PT-76. 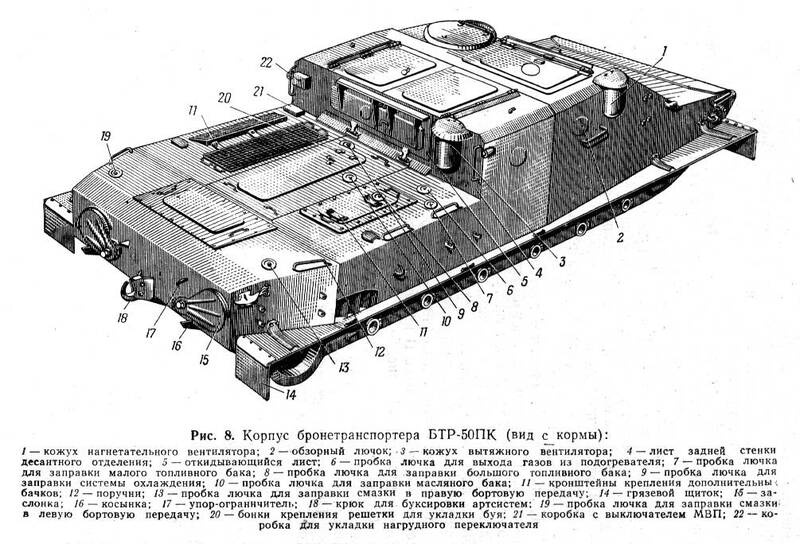 In the period between 1949 and 1950 the Soviet Armored Directorate (GBTU) laid down specifications for two amphibious vehicles for the military- one a light tank and the other an armoured personnel carrier. Aside from amphibious capability they also wanted there to be a high commonality of parts between the two variants, which would ease production problems and would also make field repairs less difficult since crews could repair both the PT-76 and BTR-50 with the same training and tools. The APC was to carry around 20 men but the specifications the directorate wanted included provisions for carrying field guns up to 86mm and to also carry small vehicles around the size of the GAZ-69. The field guns were taken up onto the rear deck via motorised lifts. The gun could then be shifted into a firing position and utilised by the crew. An interesting feature was the ability of the BTR-50 to fire these guns (up to the size of the D-44) while in the water as long as the propulsion system was engaged. The vehicle could also accommodate a weight of around two tons but some sources suggest it was rarely used for cargo carrying purposes. The engine on the BTR-50 is a V6 six cylinder water-cooled diesel, developing 240hp at 1800rpm with a maximum road speed of 44km/h. The water-jet propulsion system used in the PT-76 was also utilised in the BTR-50. Despite the fact that the 50 was developed as an amphibious vehicle, some sources suggest it did not prove to be particularly effective in un-calm waters. Add a field gun to the rear and an open troop compartment and it makes things considerably worse. Early models were also sometimes fitted with fuel drums on the rear deck to compliment the three tanks already manufactured into the vehicle. lessons learned during the Hungarian Uprising of 1956 where soldiers riding in open topped APC’s were attacked from upper floors of buildings (throwing Molotov cocktails down into the fighting compartment etc) prompted Soviet designers to re-think both the armor on the 50 and later the BTR-60P. In 1958 the BTR-50PK was adopted by the Minister of Defense and this was to be a more successful vehicle than its predecessors and was widely exported (more so than other versions of the 50). The ramps at the back for loading guns and cargo were removed, the troop compartment was covered with armor- two doors opening to the left and right on the upper deck provided ingress and egress while a forward compartment to the side of commander’s hatch could also provide this but was more likely to be used as a fighting compartment since this is where the SGMB was mounted- other weapons like RPK’s and RPG’s could also be deployed by troops in this hatch. An NBC protection system was also newly installed. Serial production began in 1959 at the Volgograd Tractor Plant. Improvements to the 50PK in Russian service followed closely with those added to the PT-76 and these included improvements to the commander’s periscopes to enable night-time driving as well as several upgrades of communication systems. Production of the 50PK ended in the late 1960s and estimation for the units produced vary with the highest being around 6500 units, but it is likely to be somewhat less than this. In Russian service the 50PK was considered to be a very reliable and admired vehicle despite the low armor quality that could not stop heavy calibre weaponry. Eventually the cheaper BTR-60PB and the tracked BMP-1 saw the 50PK phased out of service in the 70s. Variants like the command 50PU and UR-67 Mine Clearance Vehicle did stay in service longer but were eventually themselves replaced in Russian service. Globally the 50PK was widely sold. Apart from Warsaw Pact nations it was sold to various Middle Eastern states and has since found its way into many African and Asian countries where it remains in service. Czechoslovakia produced their own version called the OT-62 and the Chinese had already been building an indigenous copy of the PT-76 (Type 63) and so also manufactured their own version of the BTR-50, known as the Type 77, the main differences being that the Commander’s hatch was on the right hand side and it included a 12.7mm machine gun mounted over the Commander’s roof hatch. Despite being designed over sixty years ago the BTR-50 is still in service with some countries and there are several ongoing upgrade programs for it. These include the Indonesian PAL-AFV based on a 50PM. The PAL sacrifices crew space for a better engine and increased armor protection. Yugoimport also offer an upgrade that is quite impressive, called the BTR-50S it includes a Jednoclanoj turret sporting a Zastava M-86 30mm cannon, co-axial 7.62mm MG and two Maljutka rocket launchers. The Ukrainian firm Kharkiv Morozov Machine Building also offer an upgrade package, known as BTR-50M or 50 Morozov which is similar to the Yugoimport upgrade but includes a new Russian-made V6 engine. So, despite its vintage, the BTR-50PK, oft overlooked and overshadowed by other APCs, looks set to continue in service for a few more years to come. This is really a kit of two halves (because it has an upper and lower hull!…get it?...modeller’s humour?…anyone?...) - one old and one brand new. As I mentioned earlier the 50PK is based on the hull of the PT-76 and in 2008 Trumpeter released several versions of this amphibious tank. So in the box we get roughly half the 2008 PT-76 kit and half a newly tooled BTR-50PK kit, which consists mostly of the upper hull parts. The other major problem is the choice of model- the PK was a later variant from the 50P. The P and some other previous models had an interesting feature- namely two folding ramps at the rear deck of the vehicle. When lowered they could accommodate 57mm, 76mm or 85mm guns which could be transported by the vehicle but also used by the crew in the fighting compartment while on the move, even in water if proper preparations were made. The PK does not have this feature- the major changes were to include complete armor protection for the crew area and an NBC protection system. The other major difference with the PK was the addition of a pintle mounted 7.62mm SGMB machine gun. This was located on the left side of the forward crew hatch, beside the commander’s hatch. The Israelis mounted a machine gun above the commander’s cupola and I believe the Iranian’s also had this configuration. In any case none of these things have been included in Trumpeter’s kit. I feel this is a let-down because, besides the re-designed fighting compartment, the SGMB was one of the main features of the 50PK and they managed to produce a nice machine gun in forward mount for their recent BTR-60P kit- I therefore don’t see why they chose to even do the 50PK first as if they were not going to include the machine gun- why not do an earlier model with the rear folding ramps and open crew fighting compartment and then, perhaps, release the 50PK? The breakdown of contents in the kit are as follows: four grey sprues, lower and upper hull halves one small sheet of photo etch, small decal sheet and two runs of rubber band type tracks, instructions and a painting guide. Overall the parts are crisply cast and there is virtually no flash and sink marks appear to be well hidden. There are two of these sprue’s and they are both from Trumpeter’s PT-76 kit and include the wheels, sprockets, lower hull attachments and the water-jet propulsion system. These parts aren’t bad and they are cast in a slightly harder plastic than Trumpeter’s more recent releases. Against the newer parts in the box these sprues are showing their age, although not to a massive extent- they are still perfectly acceptable. The wheels are decent offerings but these sprues show their weakness when it comes to things like the spade, a flat, thin and rather limp affair as are the tow cable loops and the hitching attachments are bulky and over-moulded. Having said that they are by far not the worst renderings of these items I’ve seen- just not up to Trumpeter’s current standards. Sprue E: One of the two newly moulded sprue’s, E is cast in the softer plastic Trumpeter has been using of late. The hatches, hatch covers, grab handles, hinges (yes, hinges!) and rear armor plate are all included in this sprue. Casting is excellent with some finely rendered detail on the rear engine hatch as well as a nicely moulded driver’s hatch opening. A neat touch that I’ve never encountered before is separately moulded hinges for the crew access doors on the upper deck- a great little touch. This sprue is another of the new moulds and comprises the admirably thin side guards, headlights, propulsion jet opening covers, two hatches and the two flat fuel tanks on the rear of the lower deck. Again these are crisp mouldings and should look excellent when all fully built up. The bottom half is Trumpeter’s PT-76 bottom hull and it is a decent moulding with well defined suspension arm location holes and a good rendering of detail on the bottom of the hull including the water jet intake ports. The top hull half is obviously a new mould for this release and it is a cracker! The BTR-50PK is fairly frugal when it comes to adornments- there’s nothing much hanging off the upper hull apart from the bare necessities (and hence the relatively short instructions and small parts count- nothing to do with Trumpeter- like I said this is a spare, frugal looking vehicle). However, I can’t help but admire the shape and design of this vehicle- the way the front angles up high before sloping up twice to a high rear deck and almost pulpit like commander’s position before it levels out for the crew compartment on the upper deck. Then things drop off curtly at the back and we get a kind of separate engine deck that would probably, on the 50PK, have been a good place to sit with the high upper deck offering some head cover from the front. It was also probably a decent place to store and tie down plenty of kit. In models prior to the 50PK the ramps I talked about earlier ran down each side of the rear deck when not in use and the rear deck would have been taken up with a field gun or some sort of small vehicle or stowage item, whereas on the 50PK, without the ramps, the space could have provided several uses from cover when sitting on top of the vehicle to a nice and convenient stowage area. A small affair containing the two fiddly looking headlight guards, a light frame, a frame for above the driver’s hatch and both the ventilation covers on the rear deck. Apart from the light frames (which will take care and precision due to being thin and fairly brittle) this is a fairly straightforward etch set. A piece of string is included for the tow cable. I feel this should either be a metal braided cable or a plastic moulding. Rope really isn’t good enough these days. I feel these are the weakest point of this kit. Surprisingly, sprue E contains two plastic moulded spare tracks which show a lot more depth than the rather flat vinyl tracks. The rubber band type tracks are by no means un-usable but two things must be considered- sag is needed for the tracks on this vehicle- this is often tricky to achieve with rubber band style tracks, and it is obvious the tracks are not as good as the plastic items on sprue E. So I feel this is a definite miss-step by Trumpeter- they should have up-dated the tracks and made them that bit better or given us some plastic links in the box so you could choose. In any case the vinyl tracks will probably paint up and weather nicely enough but there are aftermarket sets out there for the PT-76 type tracks so my advice would be to look there if you don’t fancy using the kit tracks. A small sheet for the two marking options- an NVA vehicle in olive drab or a Guards vehicle in olive drab- Number series ‘1207’ is included twice for the German vehicle along with a double set of white numbers. The Russian Guards vehicle carries just the Guards insignia and no numbers. This vehicle was used extensively by other countries and appeared in a number of different colors and camouflages, often without prominent insignia or markings, thus there is actually a much broader choice of finishes to choose from than those presented in the box. As I have said the frugality of design of the BTR-50PK means the parts count isn’t all that high, hence the instructions are relatively short for a 1/35 model of this size- 8 pages with very un-cluttered placement diagrams- there’s really only 6 pages of actual instructions as the front cover and sprue contents pages take up the first two pages. This kit is one myself and others have been waiting on for a while. By far the strangest looking vehicle in the BTR family, this amphibian looked like a quirky but interesting choice by Trumpeter. I feel that based on what is in the box they could have done a better job with this kit (plastic tracks and a braided metal tow cable would have been nice) and I am somewhat disappointed that it has turned out the way it has. The 50PK was by far the most produced and operated version of the BTR-50 but, as I have said, not the most interesting. I feel a kit of one of the earlier models with the rear loading ramps and open crew compartment would have made a much more interesting release and then perhaps the PK could have followed on. Some sprucing up of the older PT-76 parts would, I feel, have made a positive difference in this release. So there is definitely a few negatives to this kit but on the positive side we have some truly nice flourishes on the upper hull and it has to be said, an interesting looking vehicle to piece together. Altogether this not a bad kit but not the best of Trumpeter’s recent releases. Highs: Nice one piece upper hull, hinges for crew access hatches are a neat touch and an interesting looking AFV to boot! Lows: Vinyl tracks are quite flat, the tow cable is just some string and perhaps some better marking schemes could have been added? Verdict: Interesting subject, some great mouldings but a let down in some areas, especially for the full price. I reckon they would have had enough references for the SGMB. A real pity they didn't include it. Perhaps we'll see an AM one before long? Thanks for those pics Adam, I have a few interesting ones to post aswell, will do it once my internet connection stops messing around! Have you got any pics or articles about those modifications? Erik- thanks for taking a look, glad you liked the review. I know earlier in this thread we were talking about the SGMB and at the moment I'm building Trumpy's BTR-60P. I've just noticed, towards the end of the build, that they provide mounts for three machine guns- the DSHK on the front and two on each side about three feet behind the driver and commander's positions- these two mounts were meant to hold SGMB's- again not provided in the kit. It makes me wonder if Trumpy are going to release an SGMB set or something (the front mount could also take an SGMB).The 60P looks pretty cool with the two SGMB's mounted. Anyway, I said I would post some reference pictures and drawings of the 50PK and other variants. I want to thank Olegas ('Berkut916') for providing the links to where some of these pictures were found (they are posted in this thread: http://www.armorama.com/modules.php?op=modload&name=SquawkBox&file=index&req=viewtopic&topic_id=184493&page=1). 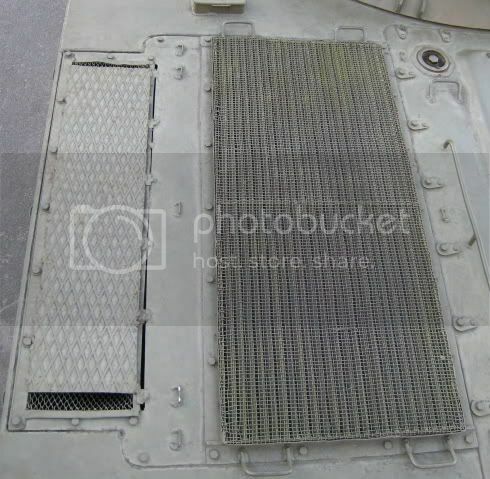 Object 750: K-78: BTR-50PA (Not the folding ramps and extra fuel drums on the rear deck): BTR-50PK: BTR-50PU: I'm currently searching around for actual pictures of the ramps on the 50PA being used and I'm looking for better info about other variants, some of which remained in use with the Red Army longer than the 50PA or PK. Feel free to post anything you guys find.